I read this article and found it very interesting, thought it might be something for you. The article is called In 2016-17, India’s Derailment Death Toll Highest In A Decade and is located at https://archive.indiaspend.com/special-reports/in-2016-17-indias-derailment-death-toll-highest-in-a-decade-12940. India’s death toll from train derailments in 2016-17 is now the highest it has been in a decade, according to an IndiaSpend analysis of data tabled in the upper house of parliament, the Rajya Sabha, on March 31, 2017 and August 11, 2017. The derailment of the Puri-Haridwar Utkal Express on August 19, 2017, killed more than 20 and injured over 200 people. The toll of 193 dead comes during a year that reported the fewest train accidents over 10 years (104) ending March 2017; 78 of these accidents were derailments. As many as 1,394 train accidents were reported in India over the ten years we considered for this analysis. Of these accidents, 51% or 708 were due to derailments. As many as 458 people have died due to train derailments over the last 10 years. Track failures and subsequent derailments are caused by twin factors–excessive traffic and underinvestment in rail infrastructure, IndiaSpend reported on April 3, 2017. As much as 40% of Indian Railways’ 1,219 line sections are utilised beyond capacity, we reported. As many as 29 train accidents were reported in the first six months of 2017, killing 57 people and injuring 58, according to this reply to the Lok Sabha, parliament’s lower house, on July 19, 2017. Of the 29 accidents, 69% or 20 were due to derailment, claiming 39 lives and injuring 54. IndiaSpend always provides very useful information. Thanks. 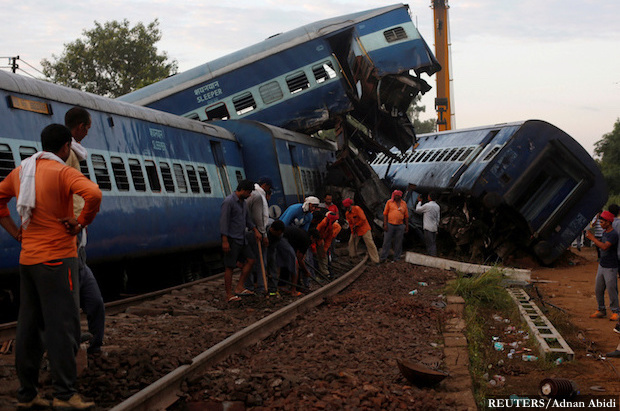 What caused the tragic train accident at Khatauli (Muzaffarnagar) on Saturday night (Aug 19): The bare facts: 1. JE (Permanent Way) is a supervisor in Civil Engineering (Permanent Way Inspector- PWI) department of Railways. A PWI is normally headquartered in junction/major/medium type stations. He is the in charge of a section of track (let us say less than 50 km length) stretching over a couple of stations. He is responsible for maintenance, repairs and attending to failures like rail fracture. Permanent way in railway parlance is the structure consisting of the rails, fasteners, sleepers and ballast, plus the underlying subgrade. The safe running of trains depends on the level of maintenance of the track and hence the role of a PWI is crucial and he is answerable for the delay/omissions in this regard. He is supposed to conduct regular inspections, trolley inspections, foot plate inspection(by travelling in engine of running train) over his section. 3. Whenever, repairs have to be undertaken, PWI is obliged to take permission from TRAFFIC department for blocking or Cautioning. But the reality is that the traffic authorities, in a bid to maintain punctuality in train running, are reluctant to give such permission. 4. Therefore, without obtaining permission, PWI usually undertakes minor repair and maintenance work by observing the safety standards in the area under his jurisdiction from time to time but without seeking permission. The result is that punctuality of running trains is affected. 5. The dark reality is that the Indian Railways network gives more importance to punctuality at the cost of safety. 6. Under the prevailing circumstances, PWI undertakes short cut. At his own level, without putting signage of BLOCK and CAUTION, maintenance work is undertaken. Railway engines and coaches continue to run as per their normal speed on Under Maintenance tracks. The grave risk is undertaken to maintain punctuality. According to knowledgeable sources, in the case of this accident, the concerned PWI was undertaking the maintenance work through his gang. Fishplates were loosened as usual. A number of trains passed even when fishplates were loosened. One train passed a few minutes before the accident on the ill-fated track. Rails had not been removed. Trains usually pass on track with loose fishplates or rail fracture. The engine and five bogies of the ill-fated train (Utkal Express) had already covered the loose fishplated track. As the train was running at the speed of 100 km per hour, loose fishplates led to misalignment of rails, causing the accident. Had the concerned PWI communicated CAUTION to the driver even when the train was 200 meters from the accident site, the driver could have reduced the speed from 100 to 50 and averted the accident.